You can always tell when Fall in the US has arrived; the leaves begin to fall, the smell of pumpkin pie fills the air, and the beeps and flashing of new gadgets come to life in the stores. This year is no different with huge releases by Microsoft, Apple, Amazon, Barnes & Nobles, Nokia, Nintendo, and a number of other manufacturers. In years past, the holiday season never seemed to be so packed full of gadgets trying to fight for your attention and more importantly your dollars. Microsoft has been very busy this Fall with releasing a number of different products: from software to new hardware. While Microsoft is typically known for their software, they have been slowly investing in a complete ecosystem that stretches from the office to the home; prodictivity and entertainment. You most likely utilize Windows and Office at the work and even at home, but that is not where the stretch of Microsoft ends. Over the years, Microsoft has been working on expanding its ecosystem to go beyond just productivity and that means focusing on entertainment. While it has not always spelled success for Microsoft, it has laid the foundation for improvements to Windows and even the introduction of the Xbox over 10 years ago. This Fall, Microsoft has rolled out a number of services and new products that expand its portfolio. While all might not be an instant or as successful as those on the market before, they provide a foundation for what is possible in the future. As I get time, I will share more detailed thoughts and comments on some of the products and services that Microsoft has recently released. From what I can tell, Microsoft is focused on creating a connected and complete ecosystem across all its software and hardware platforms. This unifiied platform and all encompassing ecosystem is for the most part a one of a kind, and will be interesting to see if it is what people are looking for or if it is simply ahead of its time. Let me know what your thoughts are on Microsoft's direction. It is a bit early to tell since new OSs and ecosystems take time to unfold at times especially when people might want to participate in the ecosystem but cannot because of phone contracts, fear that it will not run on their current hardware, or simply disruptions in daily habits and workflow. I have been looking at different ways to improve visibility of not only my blog (posting regularly helps), but also a project that I have undertaken while working on my daily project load. If you have not heard yet, I have recently helped to start the AutoCAD Wiki Beta at http://wikihelp.autodesk.com. My hope is that the AutoCAD Wiki becomes a hub for sharing learning resources (tips, videos, and how to's), and to become a collaborative system to tackle such topics as migrating between different releases of AutoCAD. When it comes to migration, there is such a huge and diverse pool of knowledge out there that it would be great to tap into and make the ultimate resource for all to use. As you might have noticed, the latest crazy on the Internet is to feel more connected rather than a series of islands. To be connected is to be human; so in a way the human element is starting to come through the Internet. For those reasons, I have added AddThis and LinkWithin to my blog. AddThis allows you to easily share a blog entry with one of the many available social networking tools available whether you use Twitter, Facebook, or something else. To share a blog entry, simply scroll to the bottom of the blog posting and click the Permalink link. Then on the blog entry page, mouse over the Share link and click one of the social networking options. Follow any on-screen prompts to share the blog posting with others. LinkWithin provides a set of topic links for each blog posting. These related topic links come from past blog postings on my blog which you might find of interest. I hope these additions to the blog help make your visit much more enjoyable. What do you get when you take one part rich media wiki platform, one part community, and one part AutoCAD? Give up, you get the AutoCAD Wiki Beta on wikihelp.autodesk.com. Wikis are nothing new to the Internet (Wikipedia), nor are communities like the legendary CompuServe boards from years gone past, Autodesk Communities, or AUGI. In the sense of a true wiki, the AutoCAD Wiki Beta is being positioned as a "creative hub" for users to create and share content, such as tips, videos, articles, and links to other sites. Content creation and sharing is done using in-place editors right on the pages of the site; you must be logged into Autodesk.com to create and edit content. You can view the wiki without needing to be logged in. Content that is created or edited on the site goes through a moderation process before it is posted. Based on the level of changes, a technical review might be made to the content to ensure it is accurate for visitors. All postings will be moderated to ensure that the content that is being posted is appropriate for the site, which means you should not find links about blue pills, how to collect ultra-rare Beanie Babies, or where not to buy AutoCAD from. In general, content being posted should be about the products that are being discussed or covered on the wiki. The intent of the site is about sharing learning content that will help your fellow AutoCAD users. We want it to be an enjoyable experience for those contributing or simply viewing content. We also want to keep it a fresh site with new content that comes from both the community and Autodesk employees. The Autodesk Wiki site offers a "Sandbox" that allows you to get you feet wet without the fear of breaking the site. Once you have a grasp on things, feel free to jump in are rate content or even to post a tip or two. You can also embed videos that you might have on YouTube or Screenr.com that you feel would help users of AutoCAD learn a new or old feature. With the wiki beta, we are giving you the community a platform to step up and show others how you are using products like AutoCAD. For additional information on the wiki, check out the following video by Lynn Allen. This is a beta and something we are trying out right now, so its success is in your hands. So what are you waiting for, start sharing your tips, links, or videos today. We live in a fast paced world, there is no doubt about that. Technology is all around us, making us rethink the way we interact with our customers and the way company's project their branding to us. One of the things that has started catching on from your local fast food place to the floors of trade events is digital signs. Digital events replace what was once a static media and turn it into something interactive. If you live in the Green Bay area of Wisconsin, Cineviz™ is having an Open House on February 9th, 2009 to show off what they do best and that is digital sign solutions. If you do not live in the area, but ae interested in what they do, head on over to their Web site at www.cineviz.com. Cineviz is a consulting and systems integration company, dedicated to providing digital signage solutions and interactive technologies to retail, entertainment, medical, corporate and other markets. With every system strategically designed for each client’s needs Cineviz maximizes their clients marketing budget and effectively communicates their message. As a subsidiary of freshpaintdigital™, a digital media company, Cineviz offers a complete digital media solution from hardware to content development. In recent months, like many of you out there, I have been evaluating many things in the household as to what is needed and what isn't. Of course, slashing the cost of food/shelter where near the top of the list but couldn't be touched without some form of backslash in the family. So the first thing that was on the chopping block was the Cable TV (and the phone lines are next) at $70 a month. So after dropping the Cable TV, having it for 10+ years, and now receiving only the free over the air signals on the TVs did we realize why we had Cable TV to begin with. So instead of going back to Cable TV no more than 36 hours after dropping it, the search for a solution to better show access was underway. Cable TV was no longer an option with its ever growing cost, so the next reasonable choose was Satellite. The fact of having issues with weather and the need to mount a dish on my house was enough to make me skip it as an option. While the cost of Satellite is about half the price of Cable TV, the thought of switching and paying someone else again kind of defeated the purpose of dropping Cable TV in the first place. So the quest continued on. With Cable and Satellite not on the radar, there were only a few places to turn and they were physical media and downloading/streaming. Buying physical media awhile it is great to catch up on shows you might have missed; it tends to fill your house with plastic cases and boxes. An alternative to physical media is a much more none traditional way of watching shows on your TV and that is via electronic download/streaming. In the end, I went with what would be the most cost effective solution for my household based on the devices I already had in it. I am an avid gamer so I own Xbox 360 and a Nintendo Wii, both of which offer features that are not thought of as features of a gaming system. The Nintendo Wii offers Internet access via the Internet Channel. The Internet Channel allows you to browse to and watch videos from sites like You Tube, as long as they are using the Flash 7 file format. The Xbox 360 on the other hand allows you to access videos, music and pictures from a Windows PC or a USB device such as a hard drive. After some experimenting off and on, I ended up using the Xbox 360 as a media extender due to its built in Netflix connection and support for Windows Media Center. So we signed up for Netflix which offers a Watch Now option to watch TV shows as well as movies. With their monthly plan of $8.99 you get unlimited streaming and can have unlimited DVDs, but only one DVD at a time. However, Netflix doesn't offer up everything in the terms of streaming that one might want, but it is a good start though. Now with Netflix and a partial solution, the next step was to provide some additional choices because that is what it is all about anyways with Cable or Satellite. The next step was to be able to stream more videos on demand than what Netflix offered, and typically Netflix offers streaming of videos that are in physical format which leaves out new episodes with the exception of Heroes which you can watch the latest season and episodes for free via streaming from Netflix. To fill the void of new episodes and current shows, I could visit sites like ABC.com or NBC.com but that does not make for an easy solution for the rest of the family. So in addition to Netflix, I installed PlayOn on my computer which allows me to stream videos from CBS, Hulu.com and even YouTube. While this is not true Internet TV, it does allow me to access recent episodes of such shows as 24, Chuck and Burn Notice to name just a few as well as classics or off the air shows such as Alf, Lost in Space and Reba. PlayOn is not the only solution out there, as the one that looks the most promising is a solution that is known as Boxee. Boxee is in public alpha testing right now, and runs on Mac, Apple TV and Linux currently with a Windows solution in closed/private beta. Boxee allows you to stream from even more sources than PlayOn does and from a single interface. With PlayOn and Boxee out there, it will only be a matter of time until watching TV changes again like it did when Cable was first introduced. $840 - 108 - 30 = $702 (First year savings) and $732 each year then forward, based on the rising cost of Cable TV the savings will most likely increase over time. If you do not have an Xbox, but have high speed internet you can look into purchasing an Apple TV for $230 and making the necessary changes to run Boxee on it. So even after that you could be looking at about a savings of $500 a year with getting rid of Cable TV. I have not done this, but have thought of doing it on a few occasions simply for the sake of giving it a try. Before going down this road, you will want to make sure your Internet service provider does not have bandwidth limits on the plan you use and there are additional costs that I did not list. Such as $199 for an Xbox 360 which I already owned and a PC that met the minimum requirements for PlayOn which was 1.5Ghz with 5GB of free space and 512MB of Ram. I hope this can open your eyes up to a whole new world of watching TV episodes and movies. It has been a while since I have posted and that is due to a number of different reasons (personal and work related), but my life seems to be slowly returning to a state of normalcy. Well if you haven't heard yet, there is no doubt you will soon about a new piece of software called Windows Vista. After being in development for some 5 years now, Microsoft is ready to sell its latest operating system at retail tomorrow; but the question is are you ready for it. Windows Vista is definitely an impressive operating system, but is it something that you should rush out and stand in line for; that you will have to answer for yourself. (I already stood inline enough times the last few months to get a Nintendo Wii.) I tend to take my time when moving from one operating system to another and for good reason. The issues with upgrading or replacing one operating system with another can be down right painful at times because you will most likely encountered issues with your existing hardware and software that you use on a daily basis. To help you figure out if you will have problems when updraging (and even then there are no guarentees everything will go smoothly), Microsoft has release what is known as the Windows Vista Upgrade Advisor. The Upgrade Advisor checks to see if the hardware that you are running can handle Windows Vista and also the software that is currently installed on your computer. It also tosses in a bit of marketing as well while you wait for the scanning to complete. While my laptop that I ran it on is fairly new (a year old), there was hardware that the advisor couldn't tell me if it would operate correctly after the upgrade which is never a good thing. 2 out of the 7 I know I use on a daily basis and those being my HP LaserJet 2200 printer and a video capture device by Pinnacle were flagged as potential problem devices; granted that isn't too bad out of everything that is configured for this one machine. However, software is a much bigger problem as 2 out of 25 of my programs must be removed before even considering to upgrade to Vista... one of Windows is McAfee SecurityCenter and the other is my backup software. Let me know what you think, as I am curious to know if others are taking the lets wait and see how things shake out approach like I am. I will most likely pick up a copy for one of my computers though, but not for all my PCs out of the gate. If you have not seen or done anything with Windows Vista, and missed out on the closed Beta program; Microsoft is giving you a chance to get your hands on Windows Vista for about 1 year. 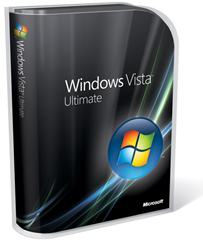 You can download Windows Vista Beta 2 or order it on DVD, based on your connection speed you will most likely want to just order the DVD and be done with it. Windows Vista is the next operating system that has been in development for some time and will succeed Windows XP. The Get Ready site gives you a lot of good information on hardware requirements, and information about computers if you are in the market to buy one today what you will need to run Windows Vista. I will have more on Windows Vista and the CAD industry as things progressively get closer to launch. To access the download or purchase page click Get Windows Vista Beta 2 link. It's amazing at ones you get use to something how easy it is to forget about the small details about it. It seems just like yesterday that Google was launched, but it has actually been 7 years since Google was brought into the vast Internet world. It sure didn't take it long to become a household name and used by millions and millions of people around the world. Congrats goes out to those at Google... and keep on doing what your doing with things like Gmail, Google Desktop and the many other great utilities that you guys are coming out with. Windows Vista - Which Edition is Right? I have just recently read an article on the editions that Microsoft will be coming out with for its next OS, Windows Vista. Now we only have two editions to contend with on the desktop today with Windows XP, Home and Professional. Microsoft plans to release around seven editions, yes I said seven. According to an article by Ken "Caesar" Fisher entitled "Windows Vista product editions revealed", that is the plan of Microsoft is going to roll-out. This could get confusing for some out there when migrating. Click here to read the article on Ars Technica's website.